Disclaimer: This game was played on both PS3 and Xbox 360. 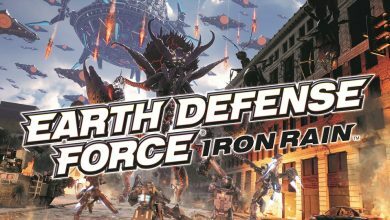 I played through the game on Playstation 3 but carried out testing on the Xbox 360 version to ensure both versions were equal in terms of performance. Initially when I played Final Fantasy XIII, I like many Final Fantasy enthusiasts was upset about the extreme lack of gameplay elements. The producers of the game were adamant on taking the fans gripes on board, and thus Final Fantasy XIII-2 was announced. 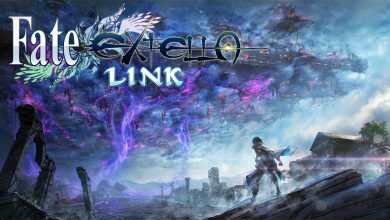 The whole idea was that Square were aiming to resolve many of the complaints received from Final Fantasy XIII while at the same time expanding on the epic storyline. The game starts off with you controlling Final Fantasy XIII’s standout character Lightning as she’s fighting off the evil forces that threaten Valhalla, a world she is now trapped in that is unbound by time. She meets a stranger from another time by the name of Noel Kreiss and passes him the task of traveling through time to find her little sister Serah. Noel and Serah must then time travel together solving paradoxes in an attempt to rescue Lightning. If you haven’t viewed any footage and ignored previous spoilers, then like me the first twenty minutes of the game may take you by shock as Square show off some of the new QTE (Quick Time Event) elements they implemented into the game. Unfortunately these potentially epic QTE cinematics are crippled by some off-putting framerate drops, and it’s pretty much a consistent problem throughout the game whenever a QTE cinematic occurs. Once you get past the action heavy introduction you take control of Serah as Noel appears in her world, eager to persuade her of her sisters request being truth. 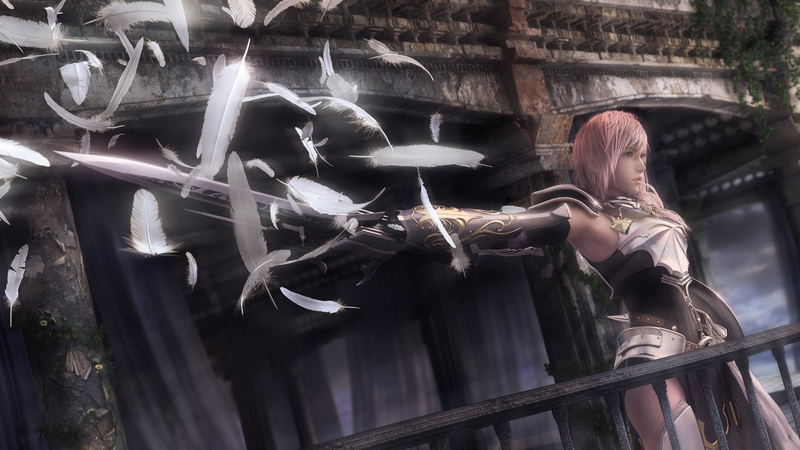 Serah who was rescued by Lightning in the previous game is now longing for her sister, and has even been haunted by dreams of Lightning fighting in Valhalla. 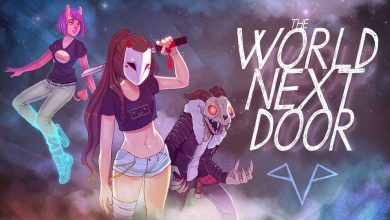 She soon decides to trust Noel and after a very fun hour long introduction to some of the games concepts, you’re soon jumping head on into the main focus of the storyline. 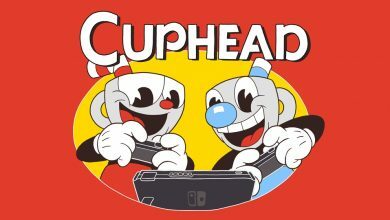 One of the many complaints on the previous game was the slow moving first half of the game in which nothing happens besides you running from start to finish through the various levels. Final Fantasy XIII-2 improves on this by presenting you with a ton of optional materials to explore early on. 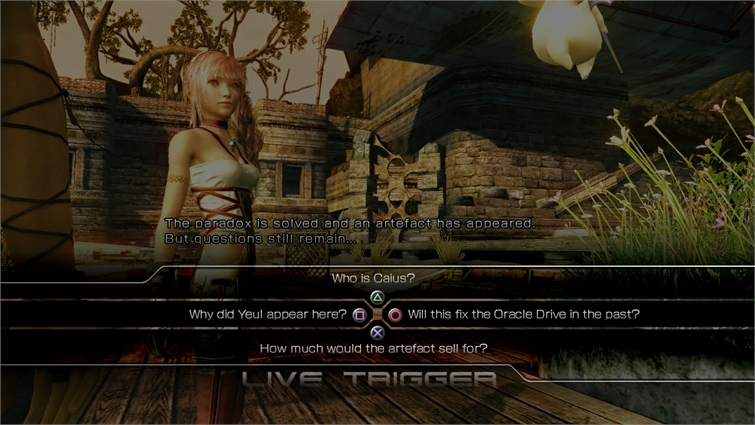 One thing I liked is that you now receive side quests from actual people instead of the random devices from FFXIII. Maps are broader in size, allowing for more intricate exploration of the environments. Hidden items are scattered all over, requiring you to cover every inch of a location so no item will go amiss. You’ll recognize a few of the environments from the previous game, though you’ll likely be covering parts of them that you didn’t before. When going back and forth in time, you’ll also notice that some areas will look different than before, which is a nice touch to compliment the story. The story however begins to feel very mediocre after a few hours in. One of FFXIII’s strengths was that the storyline was actually decent, and that alone forced you to endure everything else that was lacking with the experience. It’s seems that Final Fantasy XIII-2 is the complete opposite as the plot has been deeply sacrificed to flesh out the gameplay elements. Not only does the story feel like a reject time travel plot that was binned ten years ago, but some of the dialog in the game is absolutely cringe worthy. Playing through XIII-2 made me realize how much Square Enix were actually spot on when it came to XIII’s presentation. Even the soundtrack on this game isn’t as epic as the previous, though it’s pretty decent. One of the delightful additions to the game is The Moogle, which is a cute and mysterious creature that acts as Serah’s guardian. The Moogle (A.K.A Mog) will follow you throughout the game and can be used to your advantage. If there is an item out of reach, pressing L1 (LB) can be used to aim Mog with assistance from the right analog and pressing the R1 (RB) button will launch him, allowing him to recover the item. The most interesting thing about The Moogle is how he can give you an edge in battle. 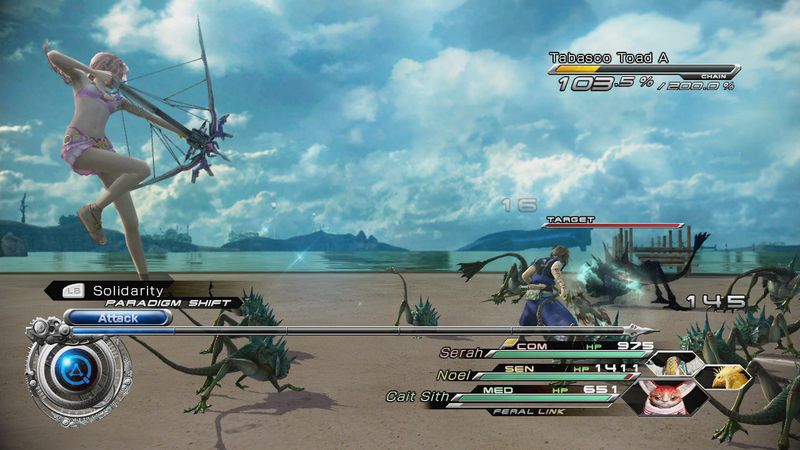 In the previous game you could visibly see the various beasts plaguing an area, at which point you could chose to run from them or confront them head on. 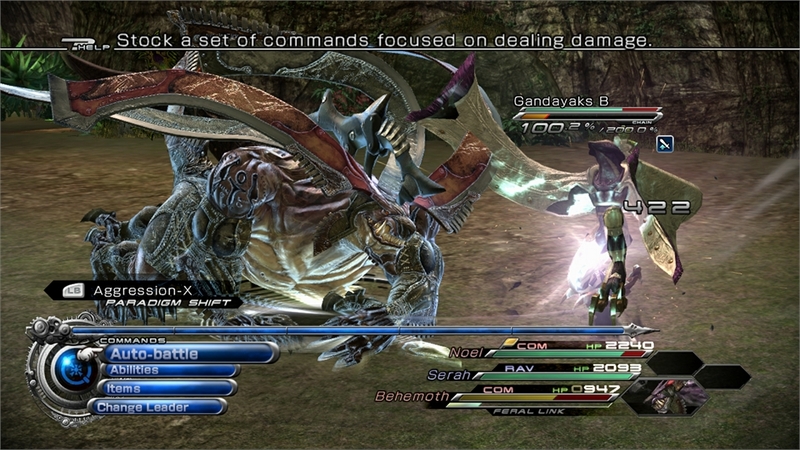 In XIII-2 however, the random encounter system makes a return. As you explore a monster infested area they will pop up at random. When this happens a Mog clock appears at the bottom of the screen showing three different colors as it counts down. Depending on which color the clock hand is pointing to when you engage the enemy determines whether you receive any bonuses heading into the battle itself. If you engage when the Mog clock is pointing green you receive a haste boost; if the clock is yellow it will result in a regular battle. If the clock is red then you will receive a penalty. If you would prefer to flee the enemy then you must successfully run out of its range which is represented by a circle on the ground. The battle system itself is essentially the same as its predecessor, but there are some welcomed improvements that make it more interesting. This time around Noel and Serah are the only two human characters you have at your disposal, but fear not as you now have the ability to capture monsters and use them to fight for you (Pokemon anyone?). Each monster has their own role, but you can assign three monsters for use in your different paradigms. For example in your first paradigm you may have a Monster that offers medical support, then once your characters are healed up you could switch to a paradigm with a monster that focuses on attacking the enemy. Mix and matching is essential here for getting the best results suited to the enemies in your current environment. Monsters can also be leveled up using special monster materials, you can even go as far as naming and decorating your monsters. Each monster also has a special ability which is known as a Feral Link. Once their gauge fills up in battle you can unleash this special ability which is enhanced using QTE commands. Another improvement to the battle system that I was pleased with, is the ability to change leader during battle. 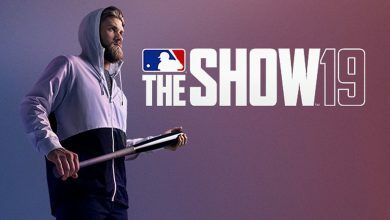 This game allows you to modify the behaviors for each paradigm; however you may find sometimes that the non-leading character isn’t utilizing abilities like they could be. Being able to switch to the other character is useful in this scenario as you can then input whichever abilities you wish the character to use. Also in the previous game you would be presented with a gameover screen if the leader died, regardless of whether your teammates survived or not. This time around if your leader dies, leadership automatically switches to the second character. The Crystarium makes a return, and this time around leveling up your roles is more streamlined. 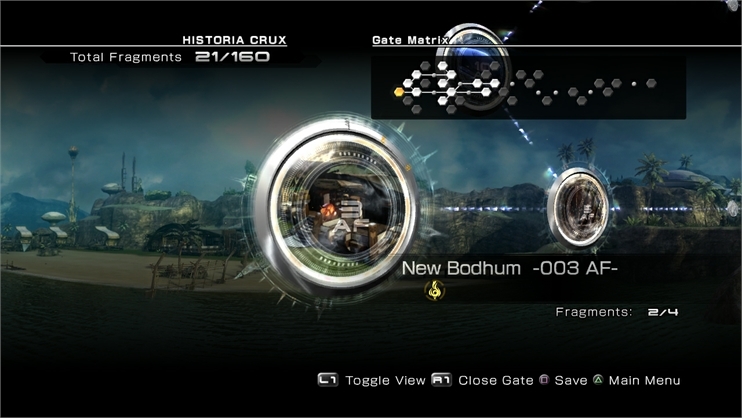 Whenever you reach the point of expanding a characters Crystarium path you can also unlock a bonus. 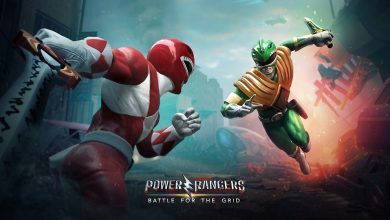 Some of the bonuses on offer are increasing the ATB gauge, adding more space for accessories or further enhancing one of the characters roles. Though it’s unoriginal and sometimes daunting, you are given much freedom with the time-travel concept via what’s known as the Historia Crux. It’s essentially just a menu which allows you to chose a location and timeframe to explore. My gripe is that occasionally it’s confusing and doesn’t offer much advice in terms of where you should go to continue the story. I find that it can sometimes ruin the flow of the game. On the plus side, it’s great if you need to go back and forth between locations to level up your characters, finish side-quests or look for previously missed items. If you do get stuck then try and remember where you may have run into a locked gate. Gates appear throughout the various locations and allow you to advance to new areas so long as you have the right artefact’s to unlock it. Artefact’s are found through exploration or completing side-quests. 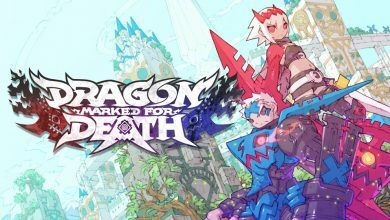 While I appreciate that Square Enix finally decided to look at what some of the other games out there were doing and then applying it to their game; they should not have attempted it unless it added something more to the experience. As I mentioned before QTE is now in Final Fantasy; some are not fans of QTE, but I welcome it in any game as long as it works well. 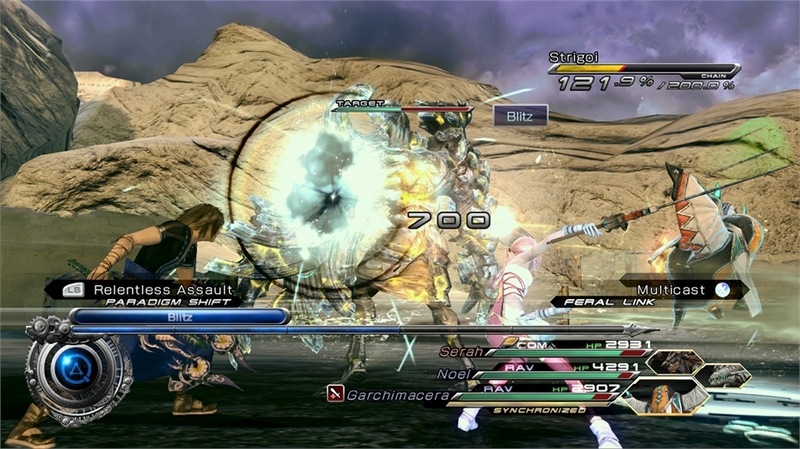 In Final Fantasy XIII-2 the QTE are little to no challenge, and when used in a cinematic fashion the framerate suffers. Also their attempts at adding interactive dialog choices are borderline horrible. Not only do they name the dialog system “Live Trigger” – but the dialog choices they give you very rarely encourage a worthy response from the other characters. Overall the system just feels like it was thrown in for the hell of it. 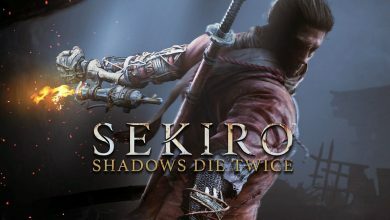 I’m keeping my fingers crossed that they’ll execute it correctly in future games, as it’s something that could bring new levels of depth to the franchise. 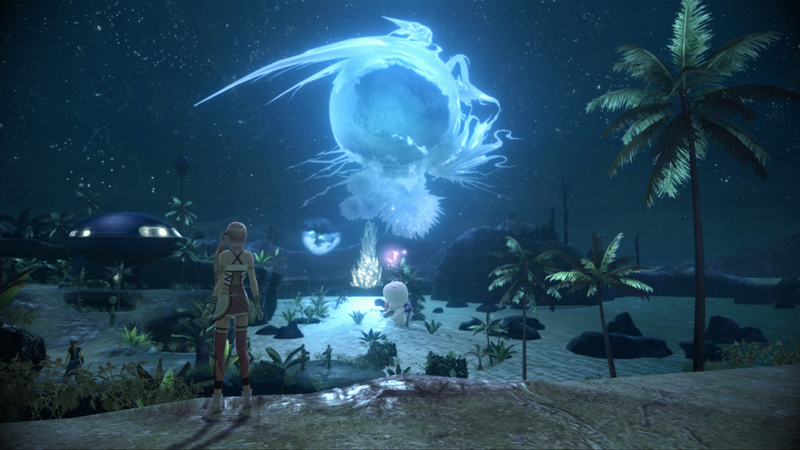 Final Fantasy XIII-2 is a decent game that improves upon the lacking areas in FFXIII. It’s just a shame that the presentation and overall emotional attachment doesn’t hold a candle to the previous game. You’ll come across some fairly difficult enemies in this game, but overall the moments just don’t live up to the epic boss battles in FFXIII. On the other hand XIII-2 encourages you to explore and soak up everything you can from the different levels. Around halfway through the game you’ll unlock a casino that allows you to play mini-games such as Chocobo racing in which you can race the Chocobo you have captured or just bet on other Chocobo. These are some of the things that were missing from XIII that just add to the immersion. I am still thankful that Square Enix took the time to address some of the concerns from the previous game; but the biggest thing that Final Fantasy XIII-2 accomplishes is showing that there really were some fantastic things in FFXIII that we overlooked due to our initial complaints. This review was based on a retail copy of the game for the PlayStation 3 provided by Square Enix.